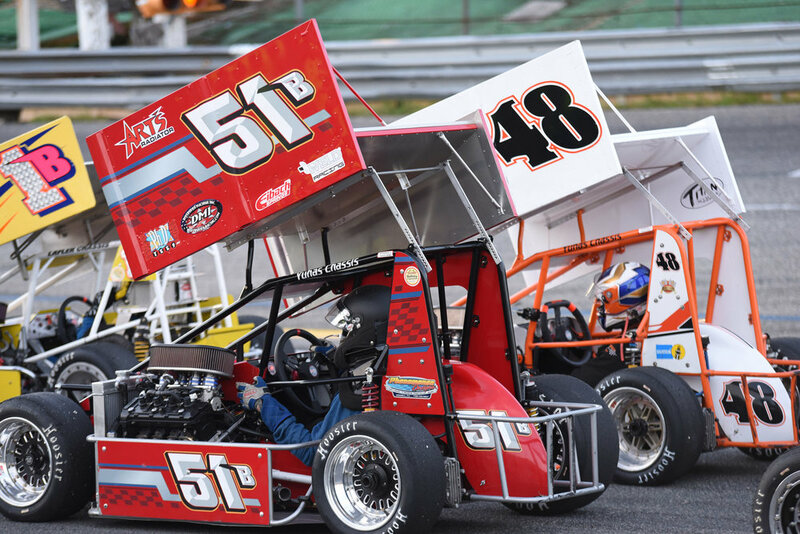 Wall Township, NJ – For the sixth event this season, the Hoosier Mid-Atlantic ATQMRA powered by VP Racing Fuel invaded Wall Stadium Speedway. This was the second of five scheduled events at the historic facility in 2018. The first of two heat races saw a thrilling battle between Mark Yoder and red hot Joey Bailey, who made a last lap pass to claim the victory. 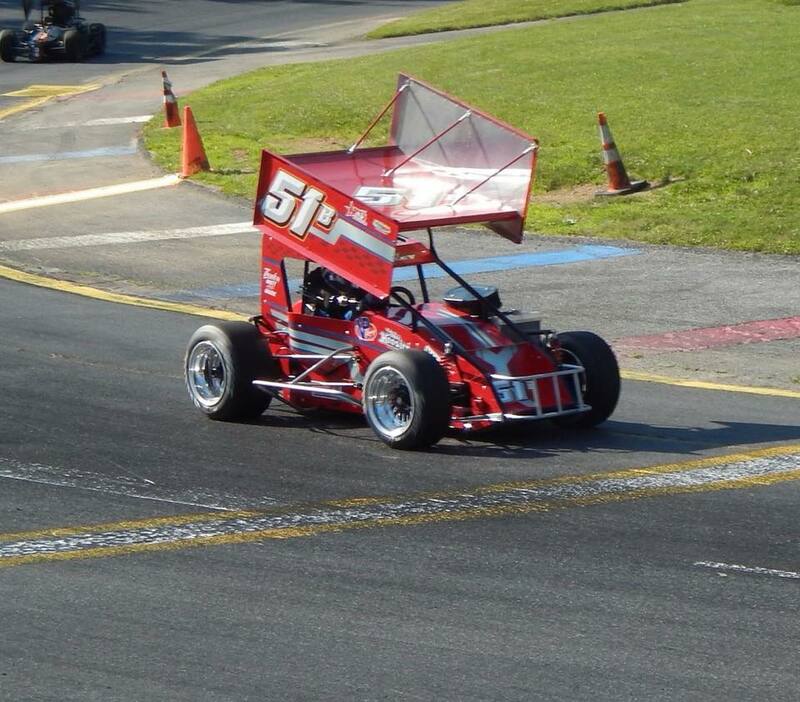 Bailey, of Monroe, NJ, entered this weekend’s race winning back to back feature events at Bethel Motor Speedway and Mahoning Valley Speedway. The second heat race was won by “Flyin’” Ryan Tidman. 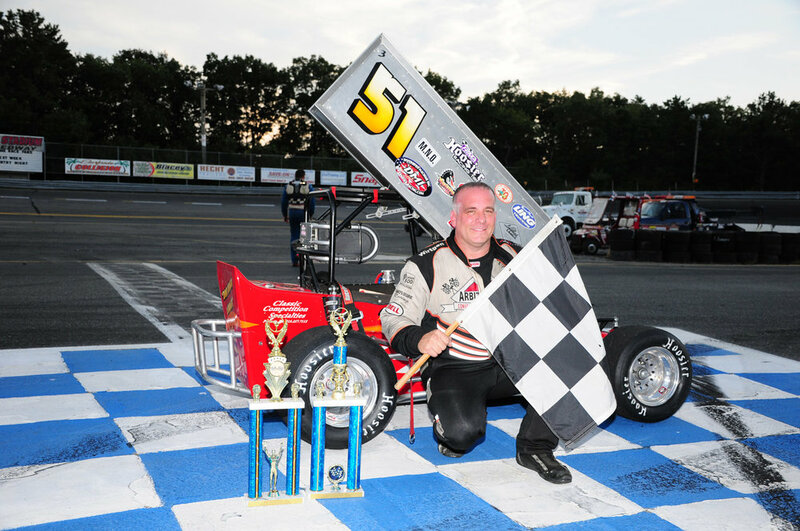 Tidman, who won the 2017 running of the Turkey Derby last November at Wall Stadium, came to the Jersey Shore this weekend hoping that he could return to the track to earn his first feature win of the season. The feature event went off without a hitch. The hometown kid, Cole Mullen of Brick, NJ, led the field to green for the 25-lap feature. Mullen would lead the opening laps of the event before being overtaken by Buddy Sload on the third lap. Sload would go on to lead the next 22 laps and would take the white flag as the leader prior to a controversial race to the checkered flag. Entering the third turn of the final lap, a hard charging Matt Janisch made a daring move for the lead. However, this move resulted in contact with Sload, cutting Sload’s left rear tire down ruining his opportunity to win the race. Although Matt Janisch was the first driver to cross the start finish line, a two-position penalty was issued due to his turn three maneuver, resulting in the pole sitter Cole Mullen earning his first career ATQMRA victory. 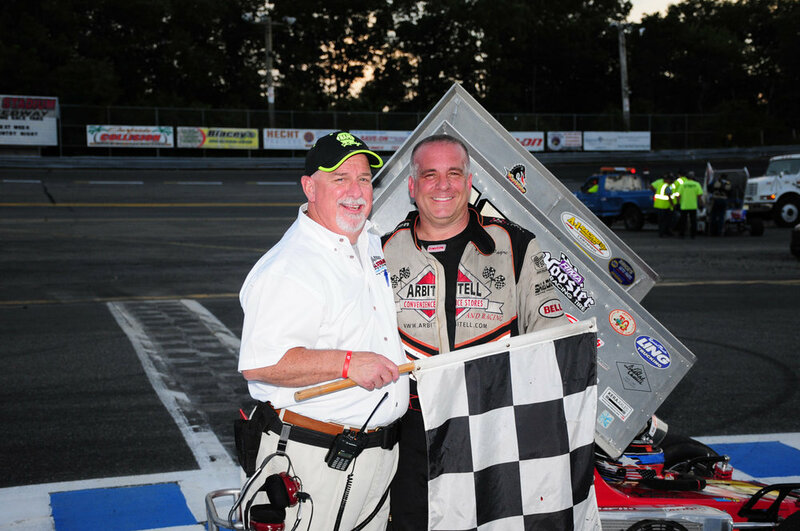 The emotional victory lane featured both Cole, his father and fellow competitor Ronnie, and entire family and crew were on hand to take part in the celebrations. 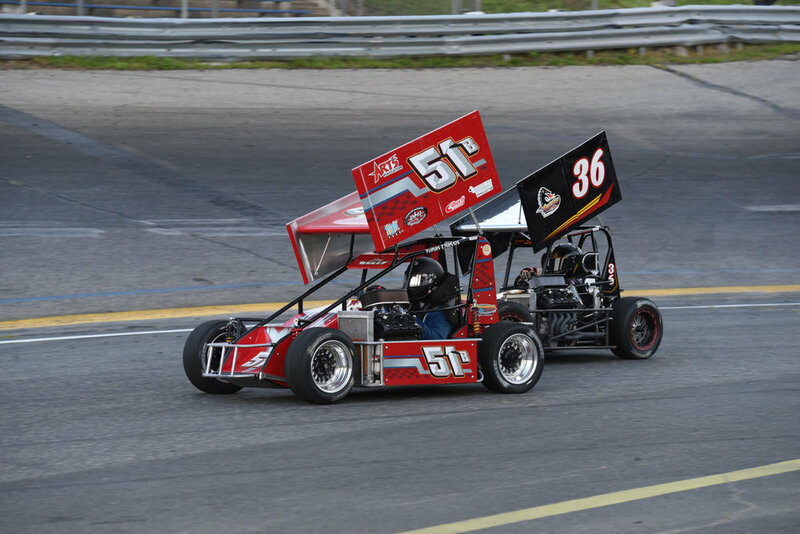 Cole has spent much of his racing career on the Wall Stadium property, earning a phenomenal reputation at “Lil” Wall, the Quarter Midget track located behind the pit area of the speedway. Joey Bailey finished second in the event, finishing just one position short of earning a three-peat. Janisch would officially be scored in third after the issued penalty from Race Control. Sload would ultimately end up forth and Ryan Tidman rounded out the top five. 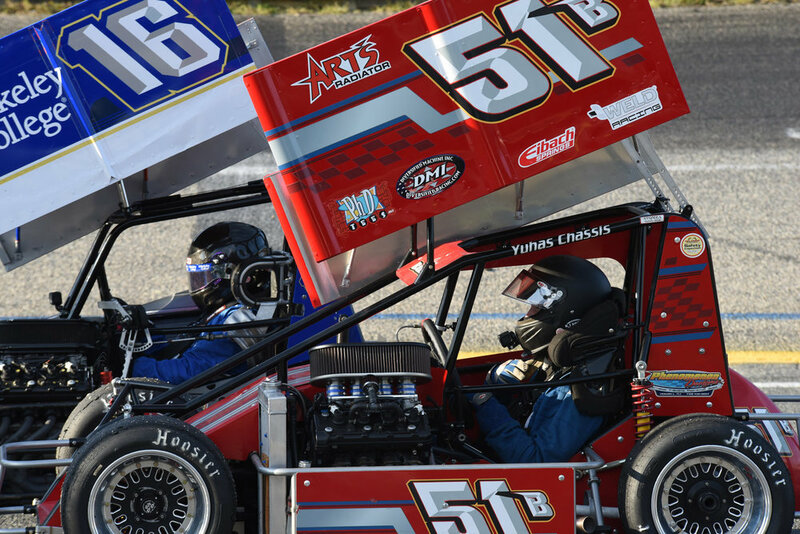 Kyle Taraska made his second start of the ATQMRA season finishing sixth. Taraska, sported new colors this weekend earning sponsorship support from his educational institution Berkeley College. ATQMRA veteran Joey Payne debuted in 2018 finishing in the seventh position. Mark Yoder, Joey Jarowicz, Paul Dodorico and Ronnie Mullen would round out the finishing order respectively. 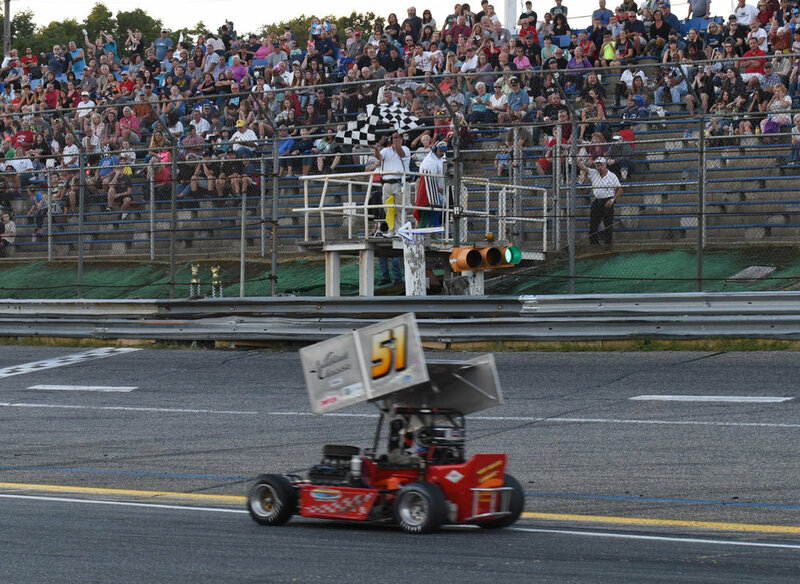 Through six events, the Hoosier Mid-Atlantic ATQMRA has featured five different winners. 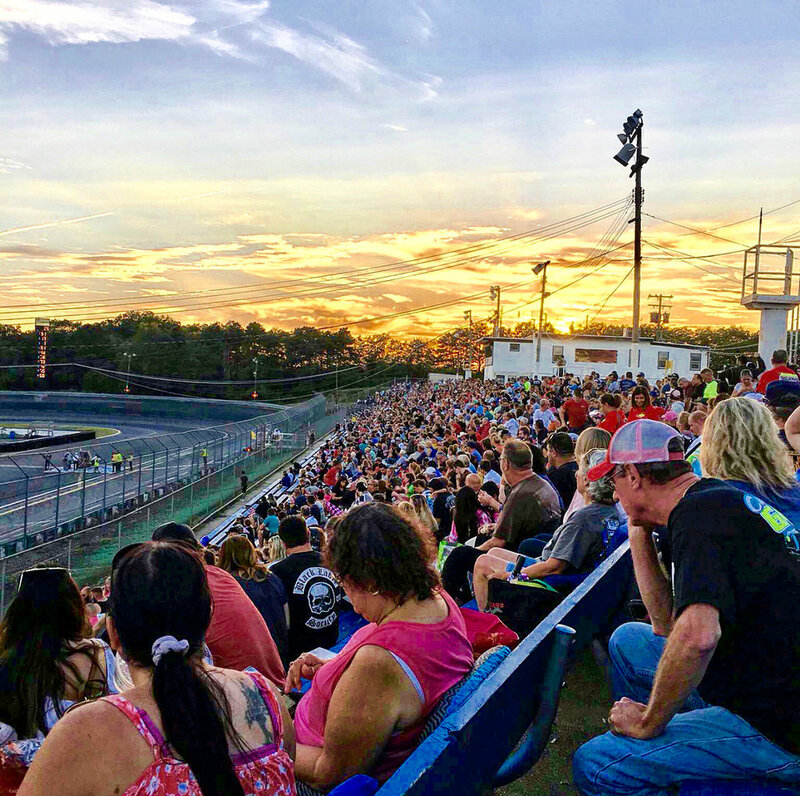 The series will be taking a weekend off before returning to Bethel Motor Speedway for the second time in 2018, on Saturday July 21st. (LEHIGHTON 6-30-18) It seems of late whenever the Hoosier Mid-Atlantic ATQMRA powered by VP Racing Fuel tour rolls in the paved ¼-mile Mahoning Valley Speedway, you can count on hometown , Kris Graver racing for the win which is easy to consider when he has won the past three events dating back to last season. And so it seemed that would again be the case this past Saturday night when Graver started from the pole. Many felt his Mahoning streak would certainly stay in tack. 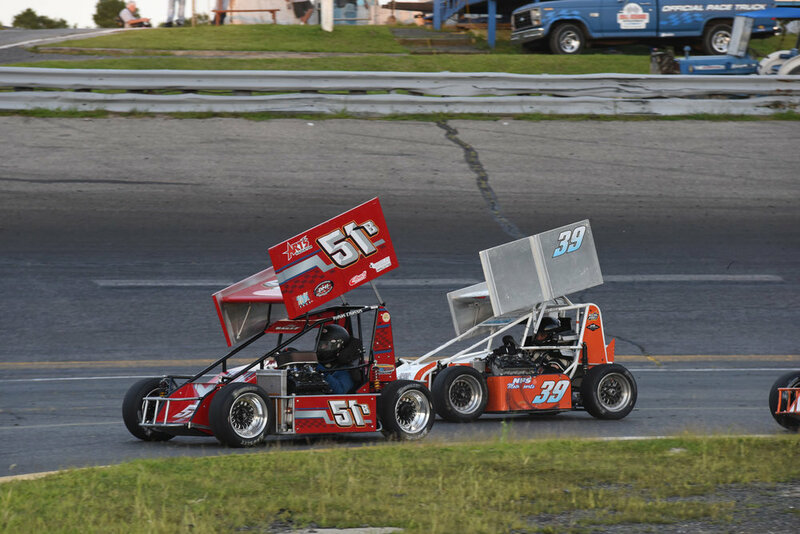 However, Joey Bailey showed that he wasn’t about to take a back seat to his teammate Graver as the Monroe, NJ driver wheeled the Alan Mollet No. 51b to a second straight win and first ever at Mahoning. Graver did go out and lead the first eight laps but Bailey, who started second, was showing good speed and in a flash zipped past Graver just as lap nine went into the books. Afterwards there was no denying him of his first visit to Mahoning’s Winner’s Circle. 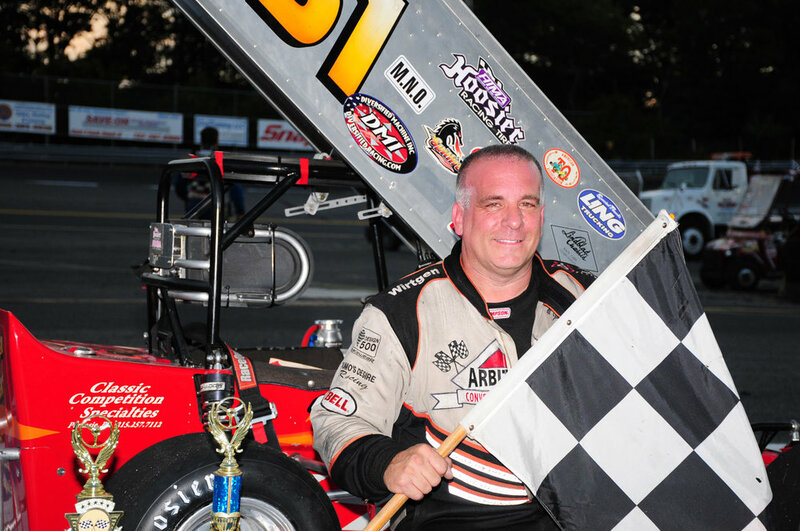 “First off I can’t thank Alan Mollet, my dad Russ Bailey and Mark and Matt Janisch enough for what they gave me with this new car it’s phenomenal,” said Bailey, who is the first repeat winner this season. Bailey knew one of the keys to winning Mahoning was not just have a good car but have the ability to get by Graver who has years of experience and over 50 wins here. 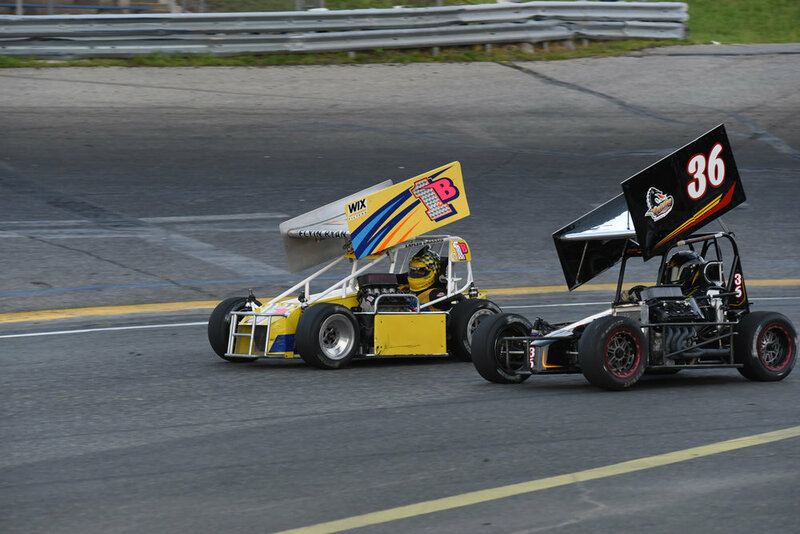 It was the first time Graver was passed for the lead in a TQ at Mahoning. “I knew I needed to get a good start and as soon as we got rolling the car felt really good to me,” said Bailey. Bailey would be credited with the fastest lap of the night also, going 9.170-seconds at 98.146 mph. Second place went to current point leader Janisch, his fourth runner-up in five starts. Buddy Sload raced home third. Janisch and Sload also copped heat wins. Bethel, NY – This weekend the Hoosier Mid-Atlantic ATQMRA powered by VP Racing Fuel took a scenic trip up to the Catskills, NY for the first event of the year at Bethel Motor Speedway. 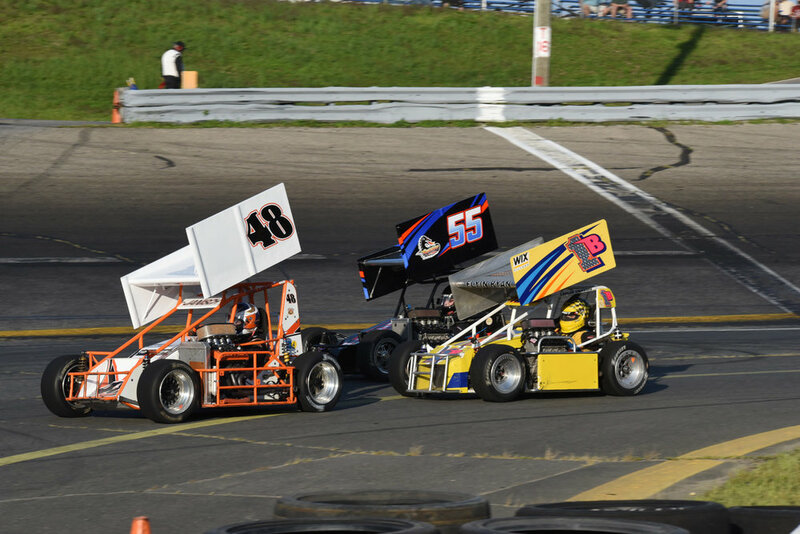 This was a special night for the ATQMRA, as the history of Pine Brook Speedway was celebrated amongst the pit area. A buzz was in the air prior to the cars hitting the track, as the news broke Friday afternoon that ATQMRA Champion Mike Tidaback would be in attendance with his wife Renee and son Mikey Jr. Tidaback, who is still recovering from an on-track incident in this year’s annual Gambler Classic in Atlantic City, NJ, was in great spirits at the track this evening. Tidaback, along with his son Mikey not only gave the command to fire engines for the 30-lap feature event, but also enjoyed three parade laps in the speedway’s pace car to the delight of the crowd. Tidaback’s #11 modified which he most recently raced at Wall Stadium Speedway was on hand to pace the field of ATQMRA competitors as well. The Mullen family, with son Cole led the field to green with his father Ronnie starting on the outside front-row. Heat race #1 winner Matt Janisch started 7th, and heat race #2 winner Joey Bailey started both due to handicapping. 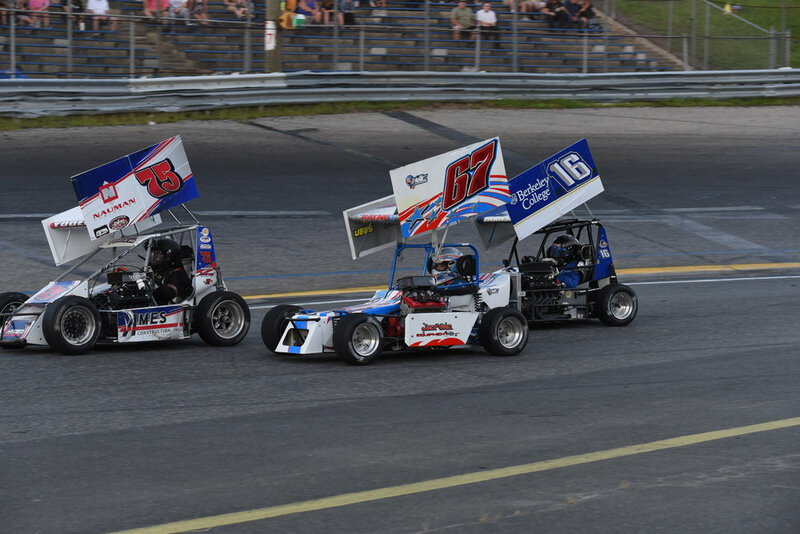 The action was fierce right from the drop of the green flag as multi-car incident involving the likes of unofficial teammates Kris Graver and Matt Janisch resulted in Graver facing the wrong way in the speedway’s infield just shy of the first corner. Graver would retire from the event as Janisch would continue on. 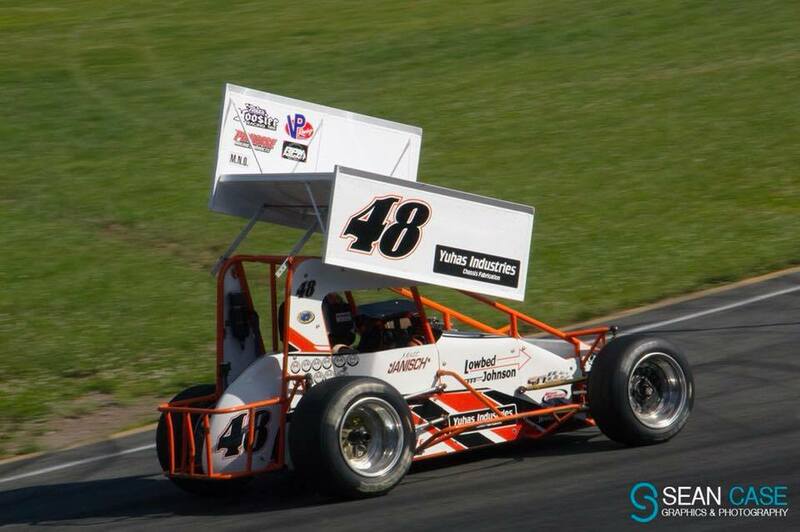 Buddy Sload was plagued with engine issues during his heat race, and the issues continued into the feature. During the caution laps prior to what would be a complete restart of the event, Sload’s Spitfire Chassis would also retire from the event without officially completing a lap. 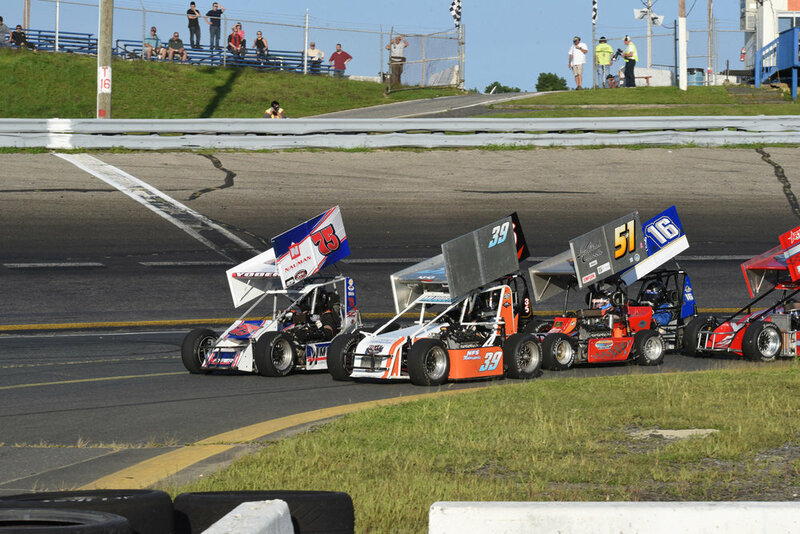 The drivers did not skip a beat as Brick, New Jersey’s Cole Mullen led the field back to the green flag and showed strength in the early going. However, C. Mullen was no match for both Joey Bailey and Ryan Tidman, who would soon overtake Mullen for the top spot. For much of the race, the battle for the lead was between Bailey, Tidman and Janisch. With even times of side by side action for the lead, the leaders put on quite the show as they began to slice and dice through lapped traffic. The second and final caution of the evening was displayed with seventeen laps remaining, as Dave Williams, making his 2018 ATQMRA debut found himself in trouble in the middle of turns one and two. This caution would set the stage for a thrilling restart, featuring a drag race between Bailey and Tidman down the backstretch on the first green flag lap following the restart. 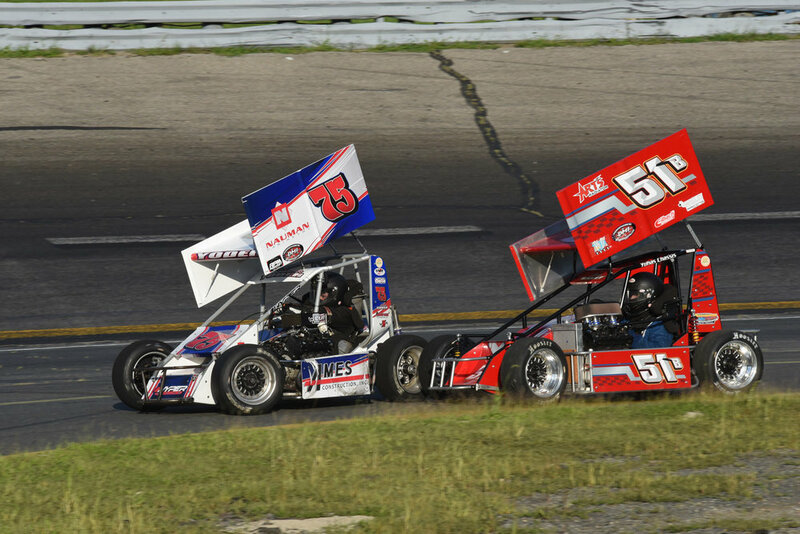 Bailey would eventually clear Tidman off of turn four and never look back. Janisch would make a late charge for the lead in the closing laps but was no match for Bailey. This would result in the third, second place finish for Janisch in four ATQMRA events this season. Joey Bailey would ultimately capture an emotional victory on the eve of his 21stbirthday. This was Bailey’s first ATQMRA feature win since his victory at Stafford Motor Speedway in October of 2016. Furthermore, Bailey earned his first trophy racing for Alan Mollot. As for other notables from the event, Ronnie Mullen had his most impressive showing of the year as he showed speed throughout the entire day. After finishing second in his heat race, R. Mullen brought his Spitfire Chassis home in sixth, his best finish to date this season. Mark Yoder returned after a one race absence as he attended the Indianapolis 500 with his family this past Memorial Day. Yoder, who overcame an oil leak during the first practice session, finished a respectable seventh. 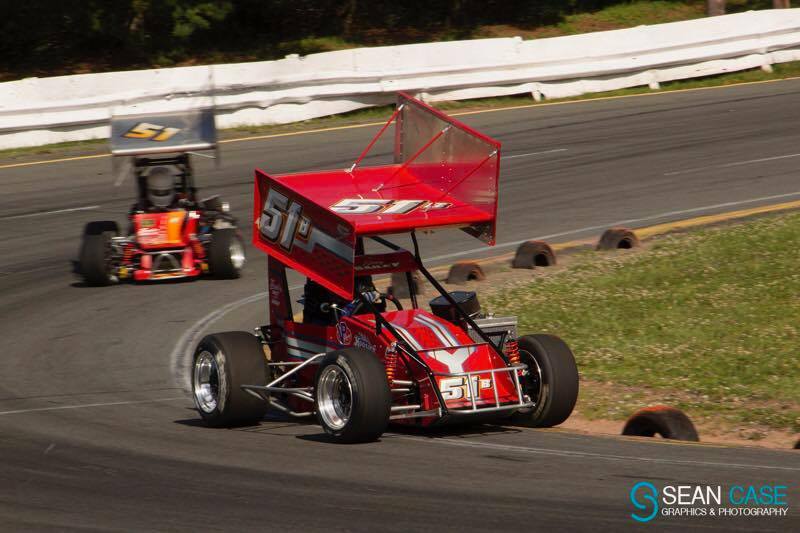 Paul Dodorico made his second start of the season in his home state of New York brought his car home in eighth. 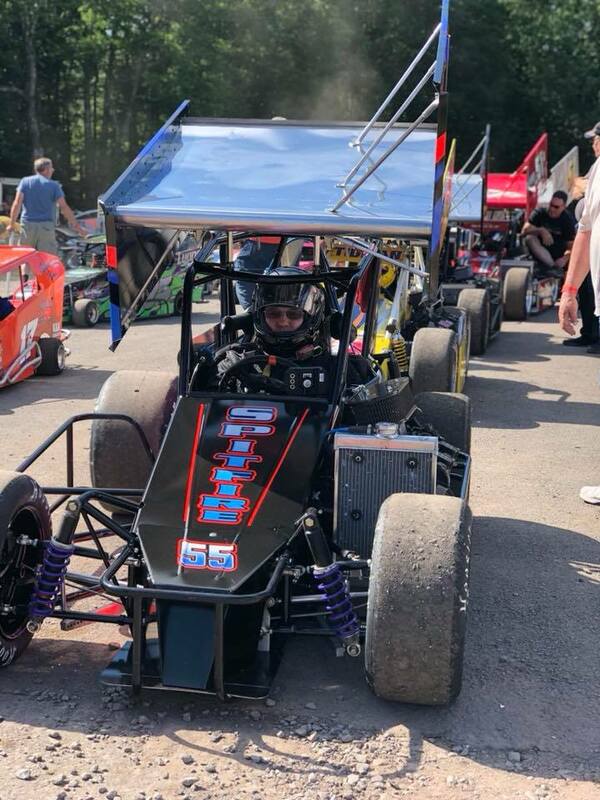 Dodorico, showed great improvement from his first career ATQMRA start at Wall Stadium last month as he continues to progress in his first season racing TQ Midgets. Through four events this year, the Hoosier Mid-Atlantic ATQMRA powered by VP Racing Fuel has featured four different feature winners. 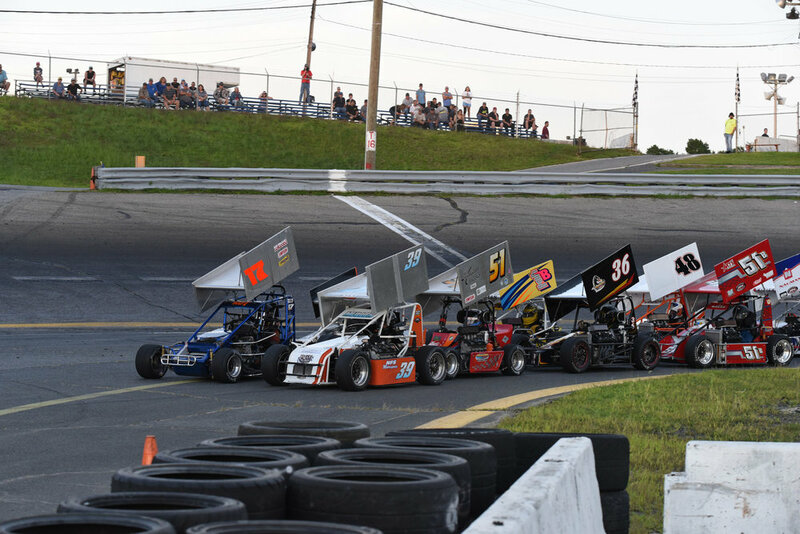 The series now heads into the off-week prior to the fifth race on the 2018 calendar at Mahoning Valley Speedway, PA on June 30th, 2018.